Although we may like to think that as dog rescuers we wear hero capes and masks, rescuing dogs as our full-time job. Sure, we wish we could spend every waking hour saving dogs and helping them find their forever homes. But to be honest, we are no different than you. Most of us work 9-5 jobs. Some of us have odd-hour jobs to pay the bills. So we often struggle with the same issues many dog owners struggle with: finding the time to stimulate and exercise the dogs we love and care for. Every dog, regardless of breed, needs some kind of activity that keeps their bodies and their minds active. And the loving blockheads in our rescue tend to need a lot. Some of us are lucky enough to work with trainers that can help provide our dogs with active lifestyles- even if our daily lives don’t allow for hours of training and those long walks on the beach. But there are also ways to squeeze the most of the hard-pressed time you do have to exercise your dog. It doesn’t take a ton of learning – for you or your dog. Once you’ve learned to strap your dog in- you’re ready to go! 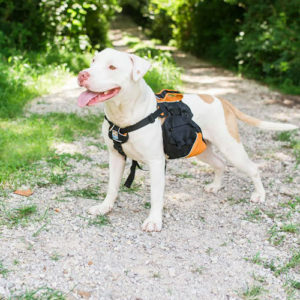 By giving your dog the job of carrying the backpack, it keeps his attention on the task-at-hand and not on the squirrels, stray cats or other neighborhood distractions. This can be a huge help for dogs with high prey drive. As your dog becomes more comfortable with their backpack, you can add physical objects for them to transport. Water bottles, bags of uncooked rice, a ball, poop bags, bags of kibble, etc. By filling the pack, you’re increasing the physical challenge of the walk, getting more work in less time. The weight of the pack differs for each dog. For most dogs, a good rule of thumb is 10 to 12% of their body weight, but you need to take into account your particular pup’s health and energy level. If your dog suffers from any health issue, or you’re uncertain about their ability to carry the weight for any reason, contact your veterinarian for guidance. Many owners also find it beneficial to start out small and increase the challenge as your dog gets more fit. Ready to pack on the benefits of a backpack? We love the KURGO backpacks! Check out www.fit4apit.com– to find the backpack that’s right for your dog as well as other cool stuff your dog will love. Or head on over to www.kurgo.com.